A national medical college trains the next generation of professionals in advancements in patient care, diagnostic testing and cutting-edge treatments; all of which are power intensive and power critical fields of study. shentongroup provided a challenging roof-top power solution that ensures this busy London college campus retains reliable continuous power, 24/7. When the college’s contractor sought to provide a robust standby generator that needed to be installed within a restrictive rooftop space, it enlisted shentongroup, the UK’s leading standby generator specialist with a proven track-record in delivering challenging generator installations. Following a thorough evaluation of the college’s energy demands, it was decided that a Powerhouse Series PHG110lvs diesel generator would prove to be the ideal solution, should mains power fail. shentongroup’s Powerhouse series generators are, not only built to world-class standards, but provide power ranging from 10 to 3200kVA. 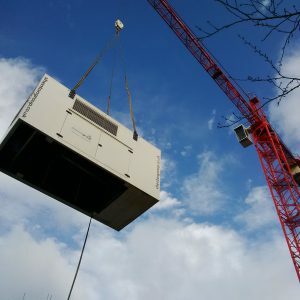 Having installed standby generators into numerous challenging and restrictive spaces, shentongroup engineers managed a flawless rooftop installation, craning the generator onto the college roof space. It was installed safely and securely within a bespoke close fit weather and soundproof canopy rated at 72dB(A) @ 1 metre. This solution was installed with no disturbance to those inside and around the college and will ensure years of reliable service. In addition, shentongroup also installed a bespoke change over facility (AMF panel), ensuring that the college will suffer no loss in the event of a full mains failure. With a fall in power being potentially detrimental to the college’s life saving studies, it is supported by shentongroup’s Power Care 24 maintenance contract; a package that provides 24/7 technical support, emergency response call outs, as well as a standard and a major service. With Power Care 24, the college has true peace-of-mind when it comes to its power continuity. To find out more about how shentongroup install leading standby power solutions and to learn more about the Powerhouse series of standby generators, click here to speak to a member of the UK’s leading technical experts in Standby Power, Uninterruptible Power Supplies and Combined Heat and Power systems.